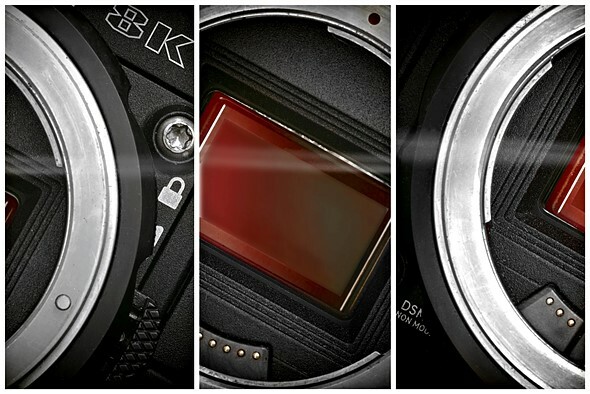 Movie camera manufacturer RED has announced that it will be introducing a new 8K sensor that it is calling Helium. At 29.9×15.77mm the new sensor is much smaller than the current 8K Dragon sensor, which measures 40.96×21.6mm, but both sensors have 8192×4320 pixels. The attraction of the new Helium sensor is that a wider range of lenses will provide sufficient coverage for its shorter diagonal, even though it is slightly larger than the standard Super 35mm format. It should also be easier to make and may take some of the pressure off the company’s difficult delivery of the larger Dragon 8K VistaVision sized sensor. The Helium is designed to operate in the same Weapon camera, but the company’s CEO Jarred Land also let on that a new camera, the Epic-W, will also come with the new sensor. The announcement was made in a casual way in Land’s July Update on the Red User forum and via pictures posted on Land’s Instagram and Facebook pages, as well as those of the company designer’s Matthew Tremblay. Little technical detail has been released so far, but it is known that the pixels will be just 3.65 microns and that the sensor will be available in ‘coming months’. For more information see the RED website and REDuser forum.